Hall in Tyrol - The Mint is part of the Tentative list of Austria in order to qualify for inclusion in the World Heritage List. On the Tentative list since 1994 as "Old part of Hall in Tirol", the name was changed in 2013 and the new nomination places more emphasis on the mint and the role of Hall in the history of coinage. The nomination includes the old town of Hall and the Hasegg Castle, the location of the historic mint. At the end of the 15th century, the first high-quality silver coin, the Thaler, was coined in Hall and in the 16th century, the roller coining machine was developed, enabling for the first time an automated mass production of coins. Today, the Hasegg Castle houses a mint museum in the rooms of the historic mint. The museum exhibits a collection of coins and several historic coining presses, including a reconstruction of the first roller coining machine. It's really a huge machine, about 8 metres long and 5 metres wide, and a complex mechanism with many gear-wheels and a waterwheel for the power supply. But usually moveable museum objects can not be part of a WHS and the castle has no structural elements that are specifically connected to coinage, it is just an ordinary castle. The most striking part is the Mint Tower ("Münzerturm"), actually the watchtower of the castle and today the landmark of the town (photo). The tower looks quite unusual: an upper part with a polygonal shape and a round base. 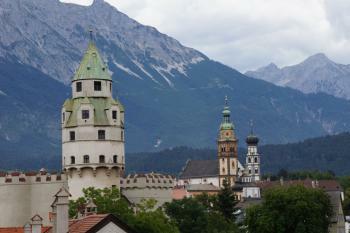 From the top you have a nice panoramic view of the old town with the towers of three churches and the Karwendel range in the background. Close to the castle is the historic town centre, you just have to cross the street. The name 'Hall' indicates that the town gained its wealth by salt mining. Pretty town houses from several periods - Gothic, Baroque, Renaissance - all well preserved, but Hall is not outstanding compared to other medieval cities in Central Europe. Certainly, Hall is a lovely old town and has also some historical significance. But the OUV of the site is primarily attributed to the historic mint and is visible mainly by the moveable collection of the museum. Moreover, the centrepiece of the museum, the first automated coining machine, is a reconstruction and thus lacks of authenticity. It will be interesting to see how ICOMOS and WHC deals with these issues. Replaces "Old part of Hall in Tirol"